A trip to a local home and garden show could be the perfect way to jump start all the spring projects showing up on your “honey-do” list. Not to mention, you might run into a few familiar faces. Appalachian Power employees are joining forces with the company’s energy efficiency contractors to work several upcoming shows around West Virginia. The Appalachian Power booth, hosted by representatives from Good Cents and Applied Proactive Technologies, showcases information about free home energy assessments, online energy check-ups and SMART lighting discounts. More information on these programs can be found at AppalachianPower.com. On a recent weekend, 18 customers signed up for a home energy assessment at Appalachian’s booth during the 43rd Annual Chamber of Commerce Home and Garden Show in Wheeling. It’s anticipated that even more will sign up once they review the information, according to Travis Paxton, Good Cents operations manager. 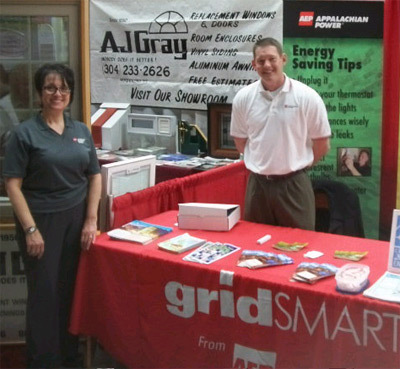 Carmen Prati-Miller, Appalachian Power external affairs manager, and Travis Paxton, Good Cents operations manager, spoke with customers about energy efficiency recently at the Wheeling Home and Garden Show. “Since the inception of Appalachian Power’s energy efficiency programs, we have provided approximately 4,250 home energy assessments to customers. We have a goal to nearly double that by year-end. Home shows are a great way to reach customers and demonstrate Appalachian’s commitment to helping them save money and energy,” said Paxton. Upcoming home and garden shows: WSAZ Home & Garden Show, Friday, March 8-Sunday, March 10, Big Sandy Super Store Arena; Huntington 2013 Home Show, Friday, April 5 – Sunday, April 7, Charleston Civic Center, Charleston. AEP Ohio’s Home Energy Savings Tour (HEST) kicks off the spring event season with a visit to the 2013 Columbus Dispatch Home and Garden Show this weekend at the Ohio Expo Center in Columbus. Company representatives will be on hand in the HEST mobile, a customized display-on-wheels designed to provide consumers with an interactive and engaging educational experience to help them reduce energy use in the home and save money on energy bills. At the event, visitors will get information about AEP Ohio’s suite of energy efficiency programs such as SMART Lighting, Appliance Recycling, Appliance Rebates, and In-home Energy Assessments and Audits. Customers will also have an opportunity to spin the “Wheel of Efficiency” for a chance to win a free energy assessment, the first step to pinpointing areas in the home where energy may be wasted. In the energy assessment, a certified energy auditor will complete an in-home walk-through and provide recommendations for improvements to make homes more comfortable and efficient. As part of the assessment, customers receive free installation of energy-saving items such as compact fluorescent light (CFL) bulbs, programmable thermostats, low-flow showerheads and pipe wrap, as well as information about rebates to make improvements more affordable. The Home and Garden Show begins Saturday and runs through March 3. Tickets are $12 at the door for adults. Children ages 12 and younger are admitted free. Parking is $5. Complete show information and a coupon for $1 off admission can be found at DispatchEvents.com. For more information about AEP Ohio’s energy efficiency programs, visit AEPOhio.com/Rebates.